I have never been a purse person but I do tend to like the oversize bag like purses that I can stuff a lot into. When you have babies you need so much stuff that a diaper bag comes in handy, but as they grow older the things you need to bring along become fewer and fewer and the need for a diaper bag is no more. I have found it hard to find that perfect bag that will be classy enough for me but yet fit a few things in it for Sadie as well. A bag that is modern and chic without a cartoon character on it but meant to hold the important things. When I heard about Luvali I knew right then and there that this was “the bag”. It is one handbag with 3 ways to use it. For review I received the Brown Eyed Girl in chocolate. The bag itself is breathtaking and has received SO many compliments that I think it has developed an ego. The classic bag retails for $80.95. Where can you buy 3 great purses for that price? It is easy to do the change over and you can have a new bag in minutes. And the brown shell alone is just as chic. The colors are very fall/winter like so it is perfect to use right now and will most likely go with your fall/winter wardrobe as the colors are very in colors. I have to say that I am super impressed with the bag. I have had reversible bags before and they are either too complicated to use or the other side is not a pattern I would like. 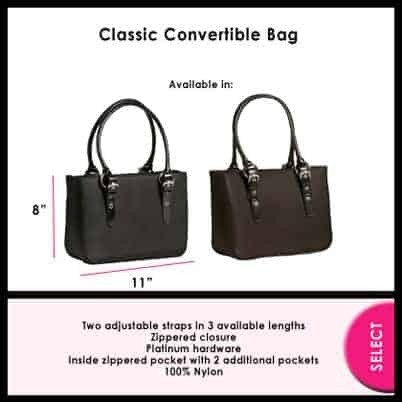 The bag has zipper closures and 2 adjustable straps that have 3 lengths. The hardware is platinum and the inside has more zippered pockets for things like your keys or cell phone. It is made from 100% nylon so its easy to clean and wipe down. This is your #1 bag to have. Luvali has 9 different patterns to choose from and 1 coming soon. You will be able to find your special style for sure. They have all the patterns in a bigger bag as well. You can even order extra slips to change it up even more. No need to pack a million purses for your trip away..just your Luvali bags and the slips you need. Brown Eyed Girl tote in Brown, very nice! I like Spot on in Black. I’m totally digging the Kimono Houndstooth – gorgeous! I like the strawberry fields in black. 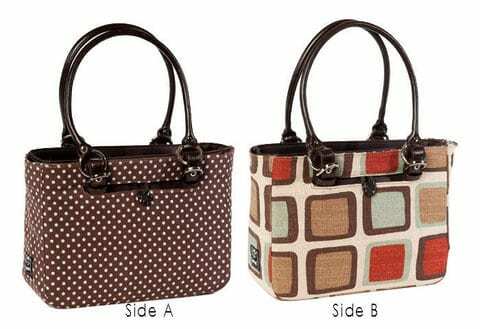 i LOVE LOVE LOVE the soho collection reversible purse!! i want to win one sooo badly!!! wahoo!! !